This whole maintenance thing is interesting. While I did have 2 months off between my 2 half marathons late fall, I was essentially injured the majority of it so I didn’t really do maintenance, it was kind of more recover from half, run, nope still injured, rest, run, hurt something else, rest AH HALF IS 2 MONTHS AWAY! Jump into training. I’ve determined for the month of June I will be in maintenance mode, July I will spend building milage back up, and August-September will be full blown marathon training. So, first official week of maintenance, it was interesting, I’m definitely feeling very rested but still have a lot of energy I want to burn. 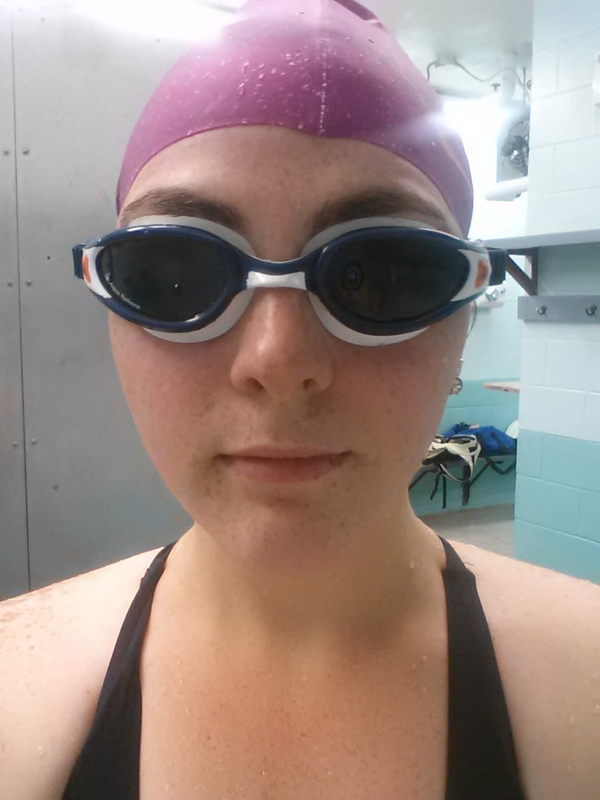 I really just love how weird everyone looks in swim caps and goggles. Swim, swim swim. I love swimming, it’s been a big part of my life, my whole life, there was a time there through high school and University I didn’t do much of it unless it was in a friend’s backyard pool but it was always something I loved. Running has made me a better swimmer, I’m constantly amazed at how much I improve without a whole lot of focus on it. It’s just something I do because I love being in the water and it works the whole body to keep things balanced from all the running. I was pumped for this, I was kind of excited all day about how I was just going to kill this workout, even though it was super hot and I was going to die, I was going to pull out some amazing times! So maybe I psyched myself up a bit too much. And also it was hot as hell. 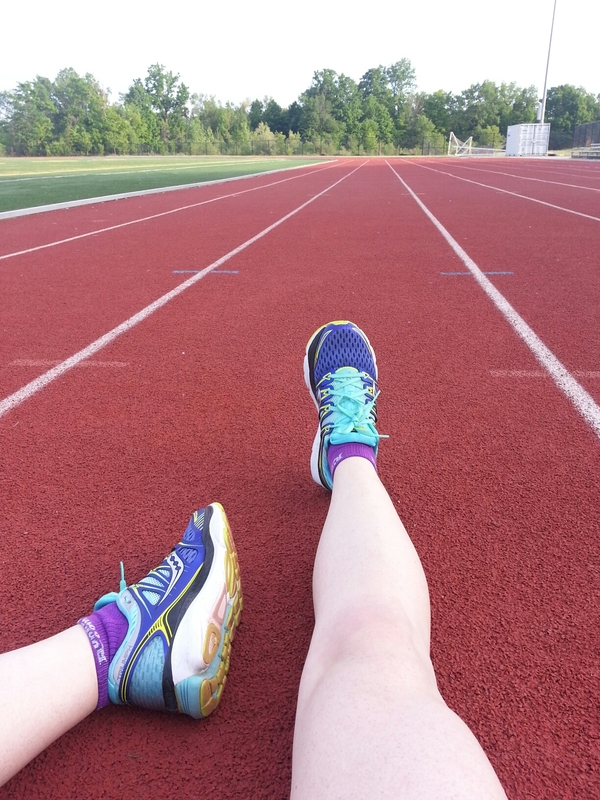 I was going to do 800m repeats but it was just insanely hot I switched to 400m so I could take more water breaks. Theoretically I only did 200m rests between the repeats, but no that’s a lie because I paused my watch and chugged water after almost all of them. I ended up only doing 6 400’s getting me to 5k. By that point I was almost out of water and it was warm despite me leaving it in the shade. Seriously killer heat. I did make some pretty solid 400m splits though! Didn’t realise the pace at the time but they were almost all in the 4:00’s! And only a hair slower than where McMillian says I should be for my 400’s, not bad given the heat,I was kind of running more towards what I’d do a 800 at instead of a 400 so pretty solid! And actually my 400’s were slightly long too since I was running in the 3rd lane. I was originally going to go rock climbing with a friend but she almost got a concussion a couple days before so she wasn’t up for it. 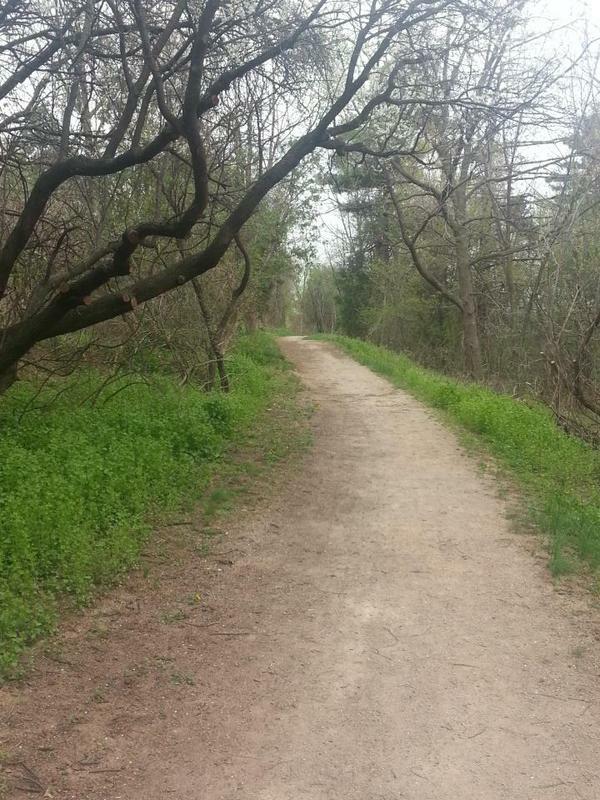 Instead we went for a walk on the paths near my work and then I went to Yin Yang yoga. Great class. I was also amazed at how easy everything felt. I think it was my first time doing yoga all year when I wasn’t sore. We went in to chair pose and I was like oh no, here comes the suffering, but I was in it, and just like, oh, this doesn’t hurt? Huh who knew. Goes to show that even when my quads felts fine, they were still tired. Man I was so ready for this run, I was so energised I could have run for ages, I felt amazing on this run, I was running a great pace and doing it pretty well. The only bit I felt really tired was right at the end when the group leader took us through the munch path and picked up the pace quite a bit but I held on a best I could! We ran 8.9km in total and that last 900m we were running a 5:35-5:50 pace, thats fast for road for me never mind the end of a run and on mulch which is one of the hardest surfaces to run on. 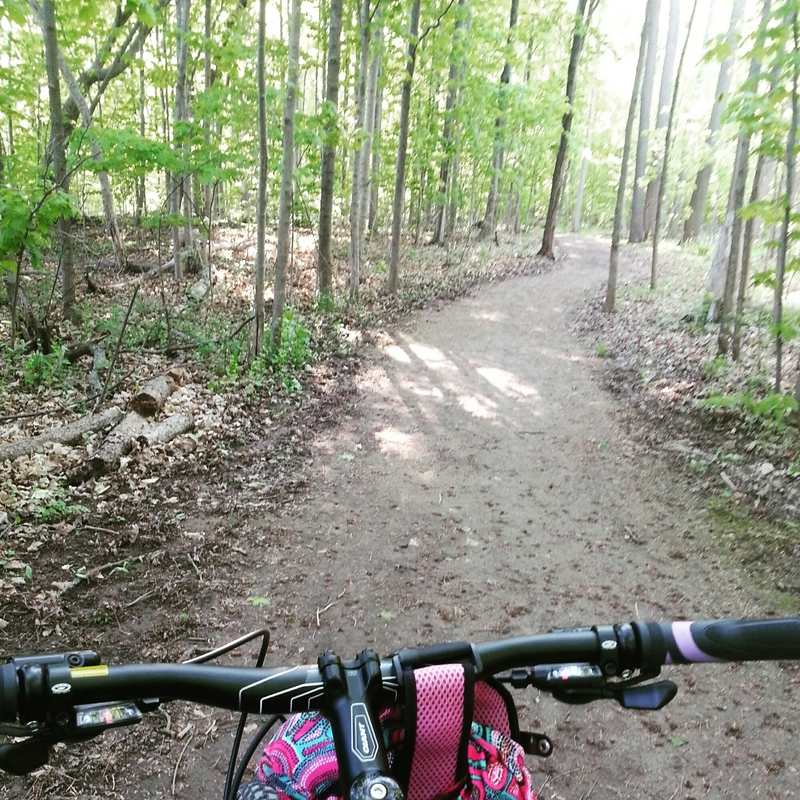 Normally I take rest day Friday but I knew I wouldn’t be able to do anything Saturday so instead I took my bike out for a ride on a stone trail. Great ride! Did 18k in total. Would have done more but the first 9 took me almost an hour since I made some stops along the way for various reasons, and when I saw the time I kind of got panicked because I start crashing when I get up to 2 hours, even on a bike. So I turned it around, and then realised I was going uphill the entire way, very very minor I didn’t even notice. But I essentially flew back to my car so I only ended up riding for an hour and a half. Great ride though! I’d never been on that trail before meant to take my bike on it last summer but never got around to it. Very pretty, especially in the area I had to turn around in I was sad I couldn’t keep going. My phone didn’t have enough juice to record my ride so used my watch so I’d know my totals. Didn’t save it though didn’t want t mess up my running records. 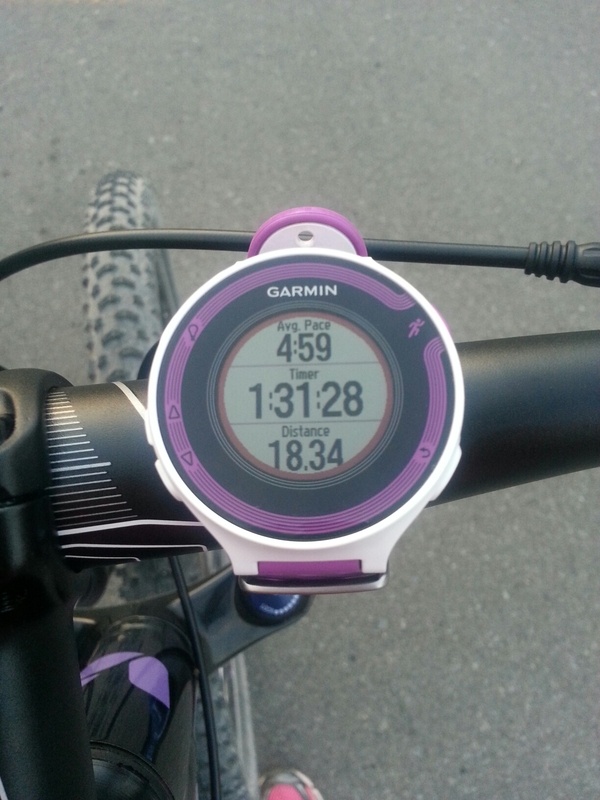 You can go on Garmin and change the activity later but the watch still keeps the records. So took pit then deleted it! 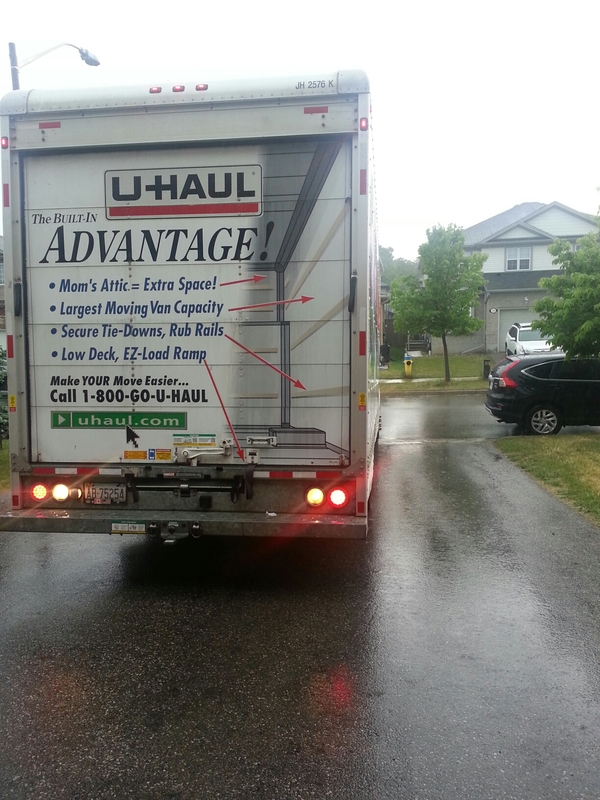 Very rainy and humid day to help a friend move. I got lots of sleep Sunday. Probably got 9-10 hours sleep during the night. And was going to go run but I was like oh its cool out today I can put it off a bit. Mistake. I was so tired and lazy, I did not end up running. And I also took 2 naps. I felt okay about it though given the day before. Less okay given all the food consumed but whatever. I’m not going to stress about missing my run, I just decided instead of cross training on Tuesday I’d run, so I basically shifted my weekend runs to during the week. Yeah sure, that’s a thing. I mean I shifted Saturday over so I picked up extra run Monday, what’s another shift over? Totals for the week 13.5 km running knew it would be low since I was moving 1 run into this week, and then ended up moving another so. Total for May: 134 km lowest this year but I completely smashed what I did during maintenance/recovery last time so there is that (79km in November & 72.5 in December). This week I’m aiming for a bit of a transition between recovery and maintenance for my running. Keeping milage low but running more days. Although I think I maybe miscalculated a bit and I’ll end up with milage around where I want my maintenance to be. But it’s kind of because the long weekend and no Sunday run is allowing me to throw an extra run in. The runs themselves will still be shorter. Sunday I intended to go for a bike ride with my friend, but she had a problem with her bike so we couldn’t. So then I ended up doing nothing. Woops. Well I did do a bit of hip strengthening exercises at least. Monday was a holiday, I was going to go for a bike ride during the day but I was kind of lazy, it was hot, and I used the excuse that I needed to save my energy for my group run that evening. Turned out I didn’t really need to worry, since it was so hot even though the 3 other people I was with are faster than me, they kept the pace slow and I was doing just fine running along with them. One of the girls was feeling pretty sore and decided to turn back early so I turned with her and we let the guys continue on. In the end we did 6.5km in about 41 minutes – I’d somehow paused my watch at some point so not sure on our exact timing. What I did see when I uploaded it though was the parts when we were running – ie not stuck at lights. We were hovering around the high 5’s low 6’s which is fabulous for me, especially in the heat. Didn’t feel like I was pushing it at all. Sign I really am getting faster! So exciting! I’m really hoping over the next few months I can get my easy pace into the 5’s. 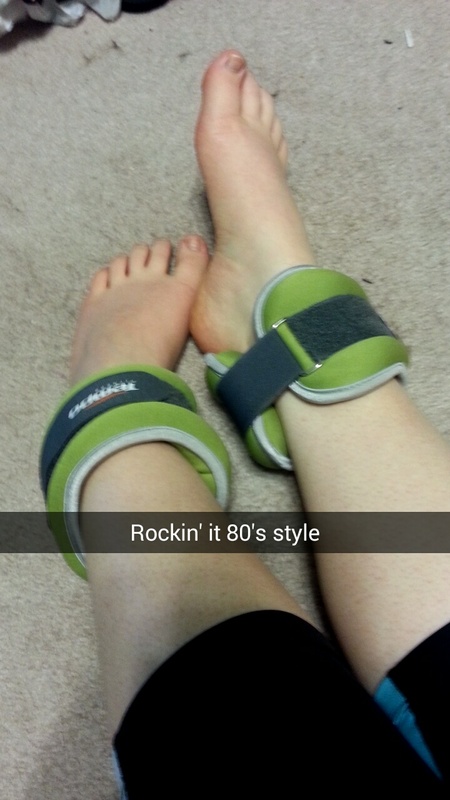 I also did a little bit more more hip strengthening work. Tuesday I knew I needed to keep my run short, this was my first time doing back-to-back running days since my half, and I want to keep my milage a bit low still, but higher than the 24k I did the past 2 weeks. With only 5k to work with and having done an easy run Monday I wanted to make this 5k worth it. I considered doing some hill repeats but my calf has been a bit tight lately so decided not to push it. Instead I decided I’d try to do my first progression run – each km faster than the last. I didn’t know what to expect of myself going into this. I actually thought it would end up being a disaster, I’d go too hard one km and then not be able to hold it the next etc, etc. I did end up succeeding though! it wasn’t as smooth as it should have been, I still have a lot of work to do in controlling my pace, but I ended up doing each km faster than the last! The first km I held back a lot. I don’t really know my easy pace right now so I wasn’t sure how things were going to go. I also had a bit of a hill climb in there and a pause for traffic, so in the end I finished the first k in 6:32. Knowing I’d kind of messed up that km and gone too fast, my intention was actually to run in the 6:20-6:25 area I decided km 3 I was fine going for 6:15. And apparently not. I ended up doing that in 6:03. I actually missed my watch beep for that so I wasn’t sure at the time what I did it in. Km 4, time to pick it up a bit. Did it in 5:52, saw the 5 ( was aiming for 6:05 ish) and thought, oh no, I don’t know how I’ll beat that now. Apparently I didn’t need to worry, I ended up going almost as hard as I could near the end, the last 2-300 m were quite the struggle (I was running in the 4’s in the last half, the downhill back helped here though) but did it in 5:16! Quite the surprise there, I really thought I was pushing to hold on to maybe 5:30’s if I was lucky. I felt so proud and accomplished after this run, especially when I checked my splits and saw I’d run km 3 faster then 2. I love maintenance period for these short runs when you really get to test yourself. Running this way, constantly checking your pace was hard, especially with the pace delay on the garmin. Does anyone else’s act like this or is there something wrong with my watch? This is something I’ve always noticed but I never really pay much attention to my watch really so it never bothered me. But it’s like, you see a pace and think oh, better speed up! And you do, you know you do, but it takes a little bit for the watch to register and show your quicker pace. Kind of really annoying when you need to rely so much on your current pace for a workout. After my run I went home, had dinner quickly and then headed to hot yoga for a core strengthening flow. Wooo going to feel that tomorrow. It was actually great, you knew you were working your core but you didn’t feel that burn you get when you do ab work. Which is fabulous for me, I’m pretty okay with that burn everywhere (unless it’s burn from holding a pose, am a baby with that, mostly cause I hate holding poses and am baby in general for those), but when it comes to feeling it in the abs I’m a baby and give up. But this was great and exactly what I need! I’ll be swimming tomorrow, haven’t been to the pool in a couple weeks. Thursday and Saturday will be the group trail runs and Sunday I’ll be doing my first long run since my half! I’ll probably do 14k or so, keep it around an hour and a half so I won’t need any gels, also haven’t been over 10.5 since so want to ease back into it, plus keep this week’s total low. We’ll see if I get any more yoga in, also possibly doing some rock climbing Sunday. Excited for that! It’s been over a year since I last went. Really looking for the complete body soreness your first time back climbing brings haha!